Burgess is the owner of Winston-Salem’s new downtown bouldering gym, Rock Box Bouldering. His vision is that Rock Box will become a central hub for the Triad climbing community, and he sees the North Chestnut Street location, a 5-minute walk from North Main Street, as an easy after-work hangout for people living and working in the office buildings, universities, and downtown apartments nearby. Burgess hopes Rock Box becomes not only a hub for seasoned climbers, but also a place for people who might not be interested in outdoor climbing but are looking for a unique way to socialize. 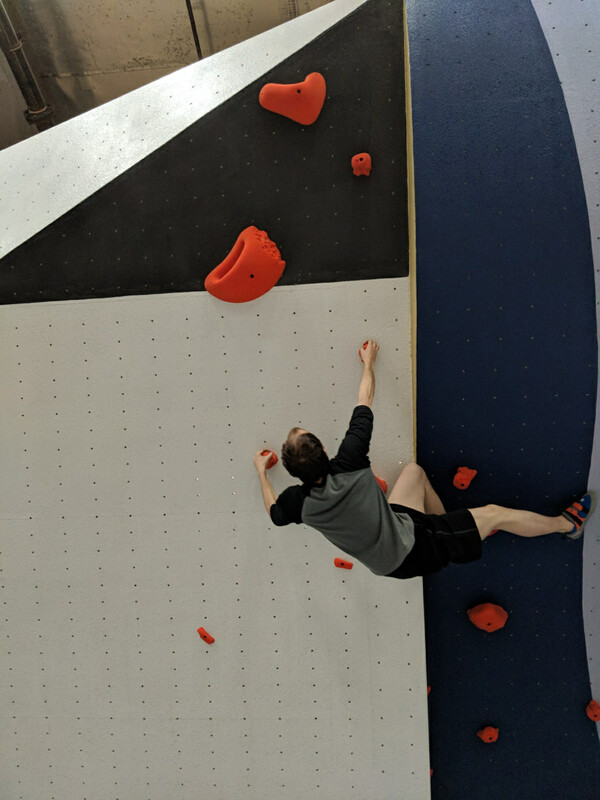 Unlike traditional climbing gyms, where climber and belayer work together in relative isolation, bouldering is set up for groups to work on problems, or routes, together. Not much gear is required, making it easier to learn. The maximum wall height is 14 feet, so no drop to the thickly padded floor will be greater than about 10 feet. Futurist Climbing has designed more than 2,000 square feet of climbing surface, and Leading Edge Climbing is responsible for the build-out. The maximum wall height is 14 feet, so no drop to the thickly padded floor will be greater than about 10 feet. The 14- to 16-inch floor padding extends across the gym floor and 10 feet past the bouldering walls in every direction. Restrooms, seating, and a workout area with free weights and machines complete the space. In the workout area, climbers who typically work back and forearm muscles on the wall can focus on opposing muscle groups, legs, and cardio for a complete body workout. Two thousand square feet remains unfinished and will be built out in the future, possibly as as private event space or a cafe. In the meantime, the front desk will stock snacks and a drink cooler. Day passes are available, but a membership will be more economical for anyone climbing at least once a week. There are monthly and annual membership options, depending on how frequently you climb. Discounts are available for groups coming in to climb together, and climbing shoes and chalk bags are available to rent. Burgess hopes to host climbing competitions and partner with downtown businesses on community events like yoga classes for climbers and pint nights. The V scale is used to set and grade gym bouldering routes, which are color-coded based on difficulty. Grading is subjective and can vary from climber to climber based on height and body type, but grades of V0 or VB (basic) are generally assigned to beginner problems, while the most difficult routes can earn a grade as high as V16. Primary factors are the steepness of the wall and the distance between and nature of the holds. Routes will range from jugs (big, open hand holds) and easy lines for beginners to difficult problems with pumpy crimps (small edges) and pinches (held between the thumb and fingertips) to challenge the most experienced climbers. "Even beginner problems will have interesting movement and puzzles that challenge you," says Burgess. Walls are designed with overhangs and steeper pitches than you might find when you’re climbing outdoors, a necessity from a safety standpoint to allow climbers to jump down without hitting the holds. He advises beginners to practice safe drops, starting just a foot or two off the mat, dropping, and progressing higher on the wall over time. The tight fit and stiff sole of a climbing shoe help to grip the wall, so Burgess is offering first-time climbers free gear rentals to lessen the intimidation factor. 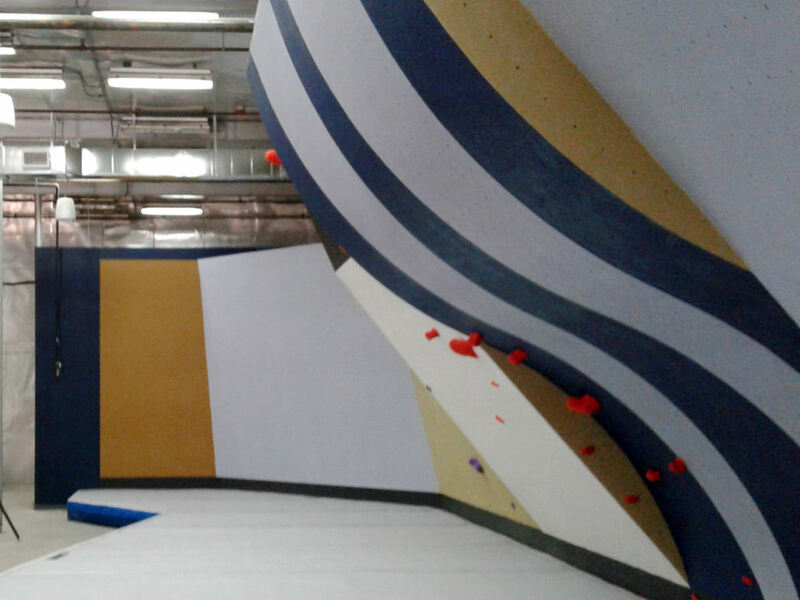 He also plans to host classes for all skill levels, including a bouldering 101 for people who are new to the sport; bouldering technique for climbers who want to up their game; and conditioning for climbing for those interested in sport-specific cardio and strength training. Burgess also hopes to offer a class in transitioning from gym to outdoor climbing to promote the Triad’s outdoor assets. "The main way to make the transition is by getting to know people who climb outdoors," says Burgess. “The gym is a more controlled environment, and it’s great for learning and meeting people. But we’re really blessed to have great climbing areas right next door.” Rock Box will rent out climbing shoes, chalk bags, and crash pads that climbers can take to local bouldering areas in the Saura Mountains. Written by Ann Gibson for RootsRated in partnership with OrthoCarolina. The Bluegrass state is known for many things, such as horse racing and bluegrass music, but Bourbon might be its most famous creation. This uniquely Southern drink has been produced in Kentucky for centuries, with a legacy of distilleries that still operate today. With their interest in distilling, it’s no wonder that Kentuckians are also becoming brewmasters. Over the last few decades, the state has become a part of the craft brewery movement that is spreading across the nation. The first microbrewery in Lexington was actually a distillery. Alltech Lexington Brewing and Distilling Company took some distillery space, brewed a batch of beer, and aged it in Bourbon barrels for a brew that is uniquely Kentucky. Now, craft breweries are located throughout the central part of the state, combining fruits and bourbon with beer to create ales, lagers and porters with a Kentucky twist. The best way to explore this growing scene is to follow Lexington’s Brewgrass Trail, a spinoff on the famous Bourbon Trail that goes through central Kentucky and visits the nation’s Bourbon distilleries. The Brewgrass Trail includes about 14 of the finest craft breweries in Lexington, but we’ve highlighted eight to help guide you on your journey. Alltech Brewing is the oldest craft brewery in Lexington, with a legacy of distilling bourbon that goes back to 1794. It’s one of the few distilleries that also brews beer, and, naturally, it specializes in bourbon-barrel ales. When you visit the brewery you can tour the state-of-the-art facility where large glass windows allow views of the impressive brewing and distilling equipment. Then, sip the classic Kentucky Bourbon Barrel Ale and the smooth Bourbon Barrel Cream Ale—they’re rich and flavorful and reminiscent of bourbon. Alltech’s latest beer creations add fruit in to the mix, with concoctions like the Kentucky Peach Barrel Wheat Ale or the Kentucky Bourbon Barrel Blackberry Porter. Country Boy Brewing is unpretentious beer at its finest, with the Cougar Bait Blonde Ale as its flagship beer. It’s light and smooth, yet earthy, and is a great introduction to craft beer. Country Boy also brews beers for the more cultured beer drinker, like the Ghost Gose, a tart wheat beer with sea salt and coriander, or the Shotgun Wedding, a malty brown with real vanilla beans. Unwind in the evening in the casual, unassuming atmosphere, enjoying the outdoor patio and picnic tables. Grab a bite from the local food trucks—there’s a different truck every night of the week, so take your pick of everything from Thai food to barbeque to tacos. If you only have time for one brewery tour, make it the West Sixth Brewing Company. You’ll see one of the largest and oldest craft breweries in Lexington housed in a 100-year-old building with a history of its own. The best part is that the tours are free and come with a taster glass, perfect for sampling any of the 15 to 20 beers on tap. Make sure to try Kentucky’s best-selling IPA, the citrus-y West Sixth IPA. For a smaller, more intimate setting, tour the West Sixth Greenroom just a few blocks away, where they produce small-batch experimental brews and welcome customer feedback. Join one of the West Sixth Brewing community events, which include something for everyone, from science lectures to gaming nights to yoga. At Blue Stallion Brewing you can taste-test traditional German and British ales served from a traditional wooden bar. Sip your beer while you check out the brewing equipment, visible from the tasting room. Choose from over 20 beers on tap, including pilsners, lagers, dunkels and stouts, and pair your brew with a homemade sandwich from Dad’s Favorites Deli. Strike up a game of pool or shuffleboard, or relax in the loft or outside on the patio. Come out on Monday evenings and drink for charity, as 10% of taproom sales are donated to a local Lexington nonprofit organization. 5. Mirror Twin Brewing Co.
Mirror Twin is the brainchild of Derek Defranco, head brewer and the right-handed "mirror twin" to his identical, left-handed twin brother. This was the inspiration for the twin draft system, where Derek will brew a batch of beer, and then brew a nearly identical batch, with one ingredient change, using a different yeast, grain, or hop infusion. When you visit, try the Mos’ Def, an IPA with mosaic hops and its mirror twin, the Citranomical, brewed with citra hops for a lighter, citrus taste. It’s two beers for the price of one, served side by side. You can also choose from about 20 other beers on tap, from its flagship beers to experimental and rotating taps. The brewery also partners with Rolling Oven Pizza, so you can order drinks and then scurry down the bar to pick out a gourmet pizza. Try to drop by Mirror Twin during one of its many fun community events, like themed trivia, yoga classes or music nights. Ethereal Brewing is known as the "funkier side of farmhouse brewing," with traditional Belgian farmhouse and American craft beers along with sours. Try the Ethereal Kentucky Common for a smooth cream ale or the tasty Ethereal Lambda Oatmeal Stout. The open and airy brick tasting room was repurposed from an old Bourbon distillery, and it’s a great place to play darts, unwind, or compete in a rousing game of trivia. Ethereal is right in the Historic Distillery District on Manchester Street, next to several upscale restaurants, so you can drink and then dine. Pivot Brewing is the only cider brewery in Kentucky that presses all its apples on-site. The brewery has become so popular over the last year that it enlisted the help of homebrewers in the community to help press the 30,000 pounds of apples needed to keep up with production. Pivot focuses on dry and semi-sweet ciders, like the dry-hopped Rapacious Wit, or the strawberry Gingham cider. Its ciders are creative, as is the taproom, which includes 8 different craft beers on tap, and customers are encouraged to make "concoctions," or mixes of ciders and beers. If you make a good one, you can write it on the board and name it! Come for any of the community events, with everything from food trucks to art workshops, and the favorite, ‘Yappy Hour,’ where customers bring their furry four-legged friends, with proceeds donated to the Humane Society. Created by several homebrewers, Rock House Brewing strives to share a love of brewing and music with the community. At just over a year old, Rock House already has a wide variety of beers on tap, with everything from pale ales to browns to sours. IPA lovers will happily throw back a pint of the Rock House Double Kick Drum Double IPA. This brewery knows how to have a good time and hosts food trucks, bocce ball tournaments, and weekly live music shows. Don’t forget to get your tickets to the popular ‘80s prom night, where folks throw on their 80s prom duds and drink and dance the night away. Written by Jacqui Levy for RootsRated Media in partnership with Kentucky Tourism.